I was diagnosed in 1945, when I was 6. There was no blood testing device for home use at that time, so my father tested my urine every morning. That was the only test done each day. 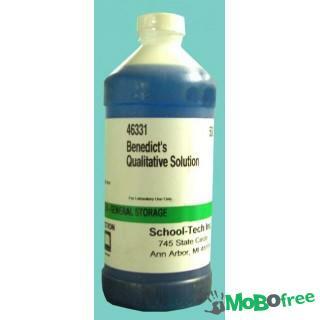 Benedict's solution (1) was placed in a test tube, and several drops of urine were added. The tube was placed into a tin can containing a few inches of water. The can was placed on a burner on the stove, and the water was boiled. The tube was then removed from the can, and the color was observed. The picture below (2) shows the possible colors that might have been seen. The original color of the Benedict's solution was blue. If the color was still blue after the boiling, then there was 0% sugar in the urine. 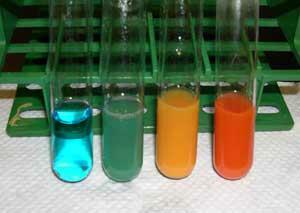 If the urine contained sugar then there was a progression of colors that could appear. Blue-green showed a trace of sugar. The higher sugar levels showed green, yellow, orange, and red. Red was the color I always hated to see because it represented very high urine sugar. Urine testing was a very poor indication of the amount of sugar in the blood. I usually had a lot of urine sugar before breakfast. My doctor did not suggest testing urine sugar at any other time of day. We should have been given instructions to test my urine before each meal, but more frequent testing could have been misleading. If I did not pass any urine between breakfast and lunch, there would still be sugar in my urine if the morning test showed a significant amount of sugar. The urine test would have shown high sugar, but the blood sugar might have been low due to the effect of the insulin taken that morning. There was usually very poor correlation between the amounts of sugar in the urine and in the blood at any time of day. In 1941, four years before my diagnosis, there was a somewhat better way of testing urine, called CliniTest. It involved placing a tablet in a test tube containing water and urine. The mixture would fizzle and become very hot. Then the mixture would show some color. Comparison of the color with a chart provided the estimated amount of sugar in the urine. The picture below (3) shows the apparatus used in performing the CliniTest procedure. No doctor ever told me about CliniTest, so I continued using the Benedict's solution, and boiling the mixture on a stove. 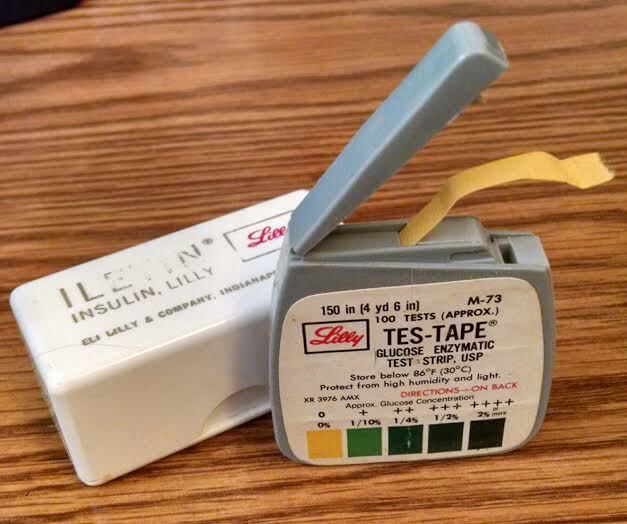 I was married in 1964, and the same urine testing routine was continued until I purchased my first roll of Testape (4). Eli Lilly introduced Testape in 1954, but it was many years later, after my marriage, that I discovered that product. I was able to dip a piece of the tape into my urine, and then see the color that was produced. The natural color of the tape was yellow. If the yellow color was present after dipping into urine, there was no sugar present. When sugar was in the urine, there was a green color on the tape. The darker the green color, the more sugar was present. I carried a roll of Testape in my pocket, and tested before each meal, even when away from home. That was a much improved way of testing my urine sugar. I used urine testing for approximately 40 years. It was not until the mid 1980s that I bought my first glucose meter to test my blood. My first meter was the Accu Check II (5). My diabetes management became so much easier, and more accurate, with the actual blood sugar levels being revealed several times each day. There were finally numbers instead of colors. I needed to study those numbers to improve my control. My blood testing showed very high numbers, sometimes in the 300s. Numbers in the mid to high 200s occurred frequently, especially after meals. There was no fast acting insulin to prevent those post meal highs. 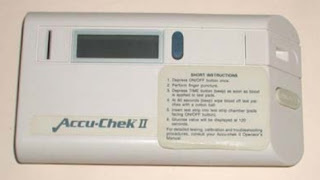 Accu Chek called me each year, and asked me questions about the my use of the meter. When they introduced new models, they sent me a new meter. That happened at least twice during the 1990s. The newer models were smaller, and they gave me numbers much faster. My diabetes management was much better. the 10-13 range at first. After 1988 my A1c's improved a lot. That was the beginning of a significant improvement in my diabetes management. I will never know how I survived all those year with very high urine and blood sugar. I feel that I may have had DKA at times, but I did not have any diabetes related complications during those early years (1945-1995). I started using a faster acting insulin (Humalog) in the mid 1990s. That is when my A1c's were greatly improved. For almost 20 years, I have had A1c's in the 5.4-6.4 range. How Do People Feel About Type 1?